PARIS — Climate skeptics donned tuxedos and walked the red carpet yesterday night to ridicule the quest for a global deal on greenhouse gases now underway in a suburb of the French capital. The American climate skeptic group Committee for a Constructive Tomorrow, or CFACT, supported by the Association of French Climate Optimists and other Gallic disputers of man-made climate change, released its film “Climate Hustle,” which attempts to make the case that the scientific community and political activists are deliberately misrepresenting the science of warming. The gala in a century-old cinema on a side street in central Paris came as U.N. talks entered their second tense week with hopes of producing an agreement on emissions and finance sometime during the weekend. But the mood at Cinéma du Panthéon was decidedly more festive than the one now prevailing at the conference facility at Le Bourget, where 40,000 participants are buckling down for a long slog. The film premier brought out climate skeptic luminaries, a few bemused Parisians, some protesters and a friendly polar bear who apparently didn’t feel himself to be at all endangered by rising temperatures linked to fossil fuel combustion. In attendance was Lord Christopher Monckton, a British peer who in 2012 was ejected from climate negotiations in Doha, Qatar, after he impersonated a delegate from the climate-vulnerable nation of Myanmar in order to address the plenary on the subject of why climate change isn’t happening. CFACT founding President David Rothbard told the crowd that the international exercise underway in an airfield a few miles out of town is pointless because the link between human-caused emissions and warming is no more established than when the Kyoto Protocol was negotiated 18 years ago. 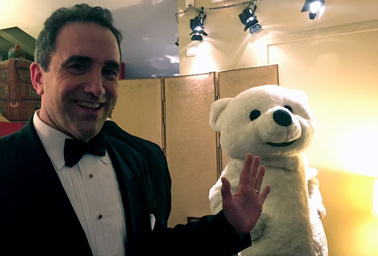 Marc Morano poses ironically with a polar bear at a climate skeptics’ movie event on the outskirts of the Paris climate summit. Photo by Jean Chemnick. It leans heavily on well-known contrarian climate scientists including Judith Curry, Patrick Moore and Bob Carter — many of whom attended the premiere — to make the claims frequently cited by climate skeptics. To wit, carbon dioxide is plant food; global warming has paused for the past decade and a half; and the medieval warming period explains warming, while the current climate is historically cool and the atmosphere “famished” for carbon. Climate scientists are a clique who resist ideas that conflict with their assumptions. Paraguayan farmer Albrecht Glatzle, who said he was in Paris representing other Paraguayan farmers concerned about how greenhouse gas restraints could affect their operations, said the science of climate change is far from settled. Glatzle said he is convinced that methane from livestock plays no role in driving atmospheric warming. And he said carbon dioxide makes his crops healthier. “As a farmer, CO2 is an ally, not an enemy,” he said.